The Air Jordan 1 (I) Retro Patent Leather Black and Metallic Gold utilizes patent leather to give it a very sleek glossy look accenting by the Metallic Gold swoosh. This 2003 retro was only one a few models to sport the patent leather look, but all executed the look very well, including the Black and Metallic Gold version. The untraditional color-way is definitely something not seen in the past, so its inspiration is unknown, but what is known is that its unique colors make it stand out from the rest of the Air Jordan I’s. 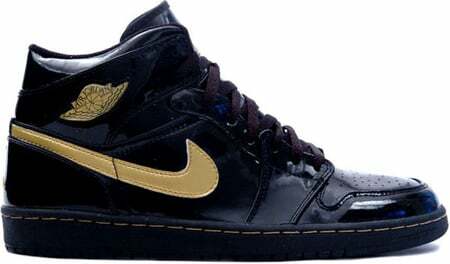 The Black Metallic Gold Air Jordan 1 (I) Retro Patent Leather was released on December 23rd, 2003 and retailed for $100. It was once sold at Air Jordan retailers, but the Metallic Gold and Black Air Jordan I Retro is long gone and is a rarity to see in marketplaces.